Canon EF-S 55-250mm zoom @ 70 mm, f/5.6. Aquired at 12.7 arcsec/pixel. Shown at 74.7 and 25.3 arcsec/pixel. 2/10 & 11/2016 Chino Valley, AZ with the Canon EOS Utility software. PixInsight processing includes calibration, debayering, registeration, cosmeticCorrection, stacking, gradient repair, and non-linear stretching with HistogramTransformation. Glowing like an emission nebula, the origin of the bubble, known as Barnard's Loop, is currently unknown. Progenitor hypotheses include the winds from bright Orion stars and the supernovas of stars long gone. Barnard's Loop is too faint to be identified with the unaided eye. The nebula was discovered only in 1895 by E. E. Barnard on long duration film exposures. At the image center we can see the Flame and Horse Head nebulae. 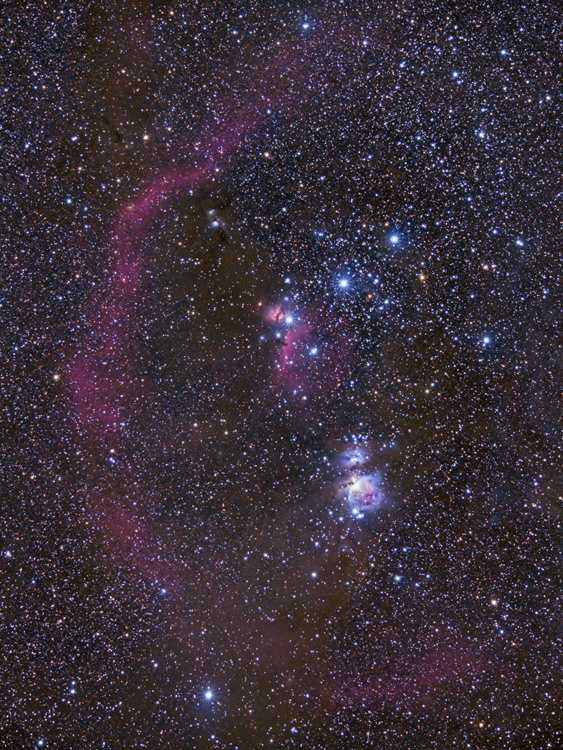 Lower and to the right is the Running Man Nebula an below that is M42, The Great Orion Nebula.